Not all collaboration is smart. Make sure you do it right. Professional service firms face a serious challenge. Their clients increasingly need them to solve complex problems-everything from regulatory compliance to cybersecurity, the kinds of problems that only teams of multidisciplinary experts can tackle. Yet most firms have carved up their highly specialized, professional experts into narrowly defined practice areas, and collaborating across these silos is often messy, risky, and expensive. Unless you know why you're collaborating and how to do it effectively, it may not be smart at all. That's especially true for partners who have built their reputations and client rosters independently, not by working with peers. 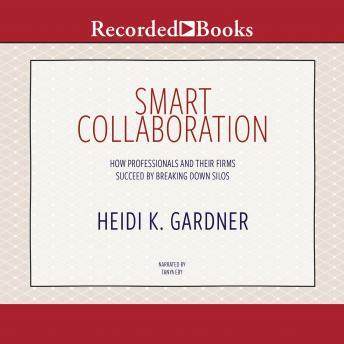 In Smart Collaboration, Heidi K. Gardner shows that firms earn higher margins, inspire greater client loyalty, attract and retain the best talent, and gain a competitive edge when specialists collaborate across functional boundaries. Gardner, a former McKinsey consultant and Harvard Business School professor now lecturing at Harvard Law School, has spent over a decade conducting in-depth studies of numerous global professional service firms. Her research with clients and the empirical results of her studies demonstrate clearly and convincingly that collaboration pays, for both professionals and their firms. But Gardner also offers powerful prescriptions for how leaders can foster collaboration, move to higher-margin work, increase client satisfaction, improve lateral hiring, decrease enterprise risk, engage workers to contribute their utmost, break down silos, and boost their bottom line. With case studies and real-world insights, Smart Collaboration delivers an authoritative case for the value of collaboration to today's professionals, their firms, and their clients and shows you exactly how to achieve it.